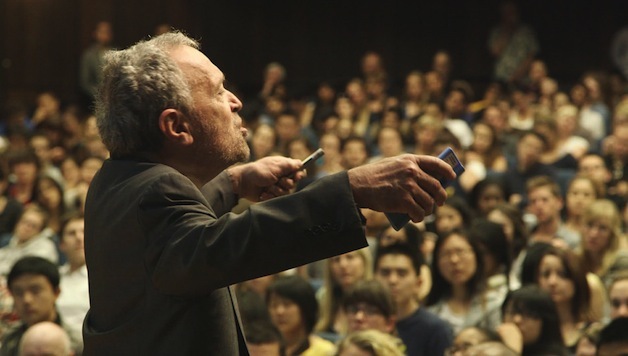 Inequality for All is a 2013 documentary film in which former U.S. Labor Secretary under Clinton, Robert Reich, examines the growing gap between America’s wealthy and working classes. Reich quickly traces the fiscal history of the United States from the onset of the Great Depression to the present, drawing parallels between the pre-1928 U.S. economy and the pre-2008 U.S. economy. He points to increased middle-class debt, decreased capitalist-class consumerism, and the wealth gap as indicators of an economy on the brink of calamity. Reich’s argument is this: The ever-expanding chasm between the rich and the poor is leading to the destruction of the middle class, and without the middle class the national economy will be crippled. If the middle class cannot remain solvent in spite of the outrageous and rising cost of living, he argues, the U.S. will find itself in a major crisis. Without the middle class’s consumerism, which the U.S. economy is desperately dependent on, the country will not be able to turn itself around financially. Reich makes little to no mention of the many people in America who already find themselves in what can aptly be described as a “financial crisis.” His analysis, although not without some truth, only scratches the surface of the roots of the recession and the potential solutions. The film is full of important dates and figures about Reagan-era financial deregulation and tax breaks that benefit the rich while decimating the poor. Unfortunately, however, Reich spends a great deal of the film’s ninety minutes romantically recounting his own political career – from Ford to Clinton – being sure to highlight that the biggest period of economic growth for the middle class was during his years as Labor Secretary. It is clear, nevertheless, that Reich is a Washington politician whose interest in the middle and working class does not go far beyond maintaining our ability to spend and consume in order to boost the economy. Reich minimizes the deliberate campaign to destroy labor unions in this country and doesn’t mention President Clinton’s participation in deregulation at all. The film fails to mention either the Clinton administration’s acceleration of “free trade” policies that shipped out millions of union industrial jobs, Clinton’s destruction of welfare as we knew it, or the doubling of the prison population in those eight “glorious” years. When he does specifically address the effect of the financial crisis on working people, he visits a Calpine factory in California where a working couple, moved to action by their inability to provide their children with health insurance, is trying to unionize their workplace. In this particular scene, one of the factory’s workers tells Reich that the company has been better to him than he “deserves” and because of that, paired with his strong religious convictions, he opposes unionizing. It’s interesting that Reich chose this as the moment to describe workers organizing, because it totally fails to demonstrate the capacity and determination of the working class to organize and struggle. This image, juxtaposed with the depiction of the compassionate, millionaire venture capitalist that Reich interviews in the first half of the film, demonstrates why working people cannot depend on Washington liberals to represent us in government or the media. One of the film’s most salient points is made by Reich himself; he says that thirty years ago, when he first started preaching the dangers of growing income inequality, his ideas were considered centrist, although now his detractors have gone so far as to call him a radical Marxist. Although Reich didn’t expound on the point, this does demonstrate something important about the changing nature of the American economy and the gross devaluation of the poor and working class. Political ideas that support and protect those other than the rich are considered radical and unrealistic among the capitalist class. Like his fellow Clintonite Al Gore, Reich seeks to monetize a long and already peaked Democratic career by transforming a lecture and PowerPoint presentation into an award-winning documentarian/liberal propagandizing/soothsaying career. However, Inequality for All offers little to working people by means of solutions to the growing income gap between the working class and poor on the one side and the rich on the other.